Our Yacht Club is easiest accessed by car, so you need no navigation skills or special sea knowledge in trading tedious everyday life for some reviving Newport elegance with a touch of the salty sea. Besides, after a visit to our wonderful spa you are sure to go home with a refreshed wind in your sails. From the very beginning, Stenungsbaden Yacht Club, attractively placed on the West Coast, has presented a solid philosophy - to provide a cosy venue suited for conference, spa and hotel guests of all kinds. We are proud members of Svenska Spahotell and can offer a pleasant spa experience to our guests with hot springs, massage, treatments and more - all in combination with a relaxed environment. It is our ambition to make our guests feel relaxed during their stay. Therefore, we endeavour to create an atmosphere and a setting where it is natural to lean back with a cold beer, with good friends or colleagues, while feeling the beating of the whispering waves of the West Coast. Naturally, your conference should be delivered according to your preferences. We can accommodate up to 600 people, we can put cars in the drawing room, or we could make space for a large orchestra if you should so wish. Briefly said, the possibilities only end where the outer walls confine our venue, and as far as your imagination stretches. Warmly welcome to Stenungsbaden Yacht Club - your entertainment harbour on the West Coast! 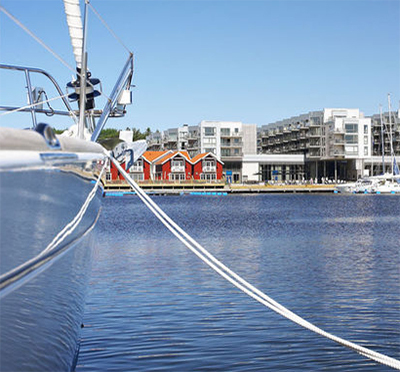 Have you been to Stenungsbaden Yacht Club and want to give your own comments?